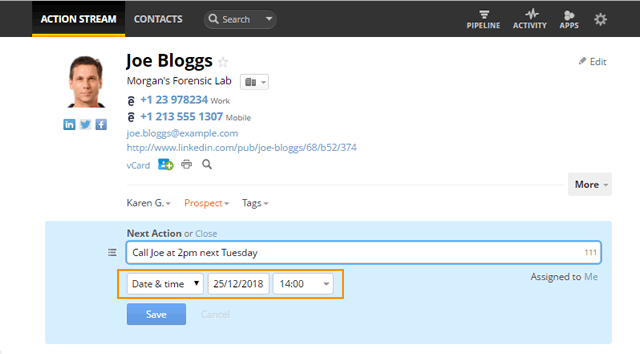 For important events such as meetings and scheduled appointments, you can include a time in the Next Action text so you don't miss out on following up. Enter your Next Action text into a blue box. 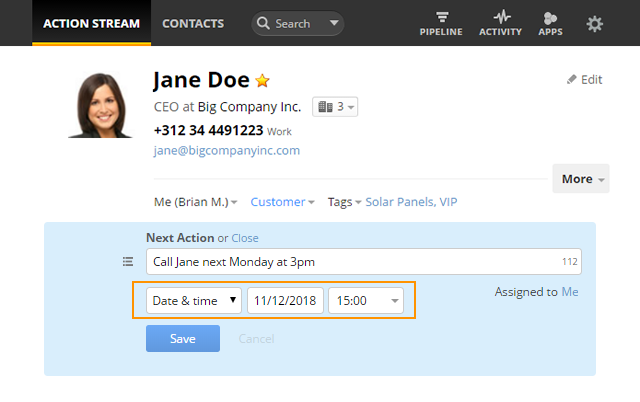 Select Date & Time option from the drop-down and set your preferred date and time. Click Save to submit your settings. Sign into the Chrome Extension, click on the OnePageCRM logo in the URL bar and enter your login details. If you've set a Next Action with time, the extension will display a pop up to show you when a Next Action is due. Note: the pop-up notification will only show for a few seconds. The majority of sales actions are “day based”, so use “Date & time” sparingly to reduce clutter.